Experience the wilderness of Karnataka, one of south India's most amazing wildlife destinations! This 12-day Karnataka wildlife tour takes you into the breathtaking wilderness of five ecologically unique and significant areas- B.R Hills, Bandipur, Nagarahole, Mudumalai and Ranganthittu. You will be welcomed at Bangalore airport by our representative who will assist you to check-in to your hotel and begin your Karnataka wildlife tour. We advise you to get adequate rest today, as tomorrow we embark on an exciting safari to see the wildlife of Karnataka. Today we start early and drive for approximately 5 hours to Kyathadevara Gudi (also called K Gudi). K Gudi is a scenic tourist spot that is part of the B.R Hills Sanctuary. B.R Hills Sanctuary, also known as Biligiri Rangaswamy Temple Sanctuary, is at the confluence of the Western Ghats and the Eastern Ghats. It is thus home to ecosystems that are unique to both mountain ranges, making it an important biological bridge. The forests are particularly famous for their population of Gaur. In addition, B.R Hills is also home to Tigers, Leopards, Wild Dogs, Sloth Bears, Sambar, Chital, Barking Deer and Four-horned Antelope. After lunch at the lodge, we will go on a safari inside B.R Hills Sanctuary. Enjoy the scenic beauty of the area and keep an eye out for the sanctuary's rich wildlife. You might even spot the majestic Tiger if you are lucky! We will return to our lodge in the evening for dinner. Today we start our day at dawn and leave on an early morning safari. Early mornings provide an excellent opportunity to sight animals. You might encounter wild elephant herds on your safari. We return to the lodge for breakfast and you can relax in the camp surroundings. The area is a birdwatcher's paradise and many species can found near the lakefront. After lunch, we leave for a safari into the forest. There is a large concentration of Gaurs in the sanctuary and it is possible to sight herds of Gaur and Spotted Deer. We return to the camp, and you can relax after a long exciting day, gazing at the stars! Today,we go on an early morning nature walk in B.R Hills Sanctuary, and it is a completely different experience compared to a jeep safari. You can observe the flora of the region and insect life on the forest floor. We return to camp for breakfast, and depart from B.R.Hills. We drive for around 3 hours to our next amazing wildlife destination- Bandipur National Park. On arrival, we check-in at our lodge and have lunch. Afterwards, we go on a game drive into the park and acquaint ourselves with the environment. Bandipur National Park is one of the best-known protected areas in India and is also a Project Tiger reserve. The park is famous for its Bengal Tigers, Asian Elephants and for the abundance of sandalwood trees. In addition, it is also home to the Leopard, Sloth bear, Panther, Chevrotain, Dhole (Wild Dog), Hyena, Gaur, Sambar (deer), Chital, Wild Boar, Barking Deer and Mouse Deer. We have an opportunity to explore the national park over the next two days. We begin the day with an early morning safari in Bandipur National Park. The greenery and landscape of Bandipur is quite mesmerizing at this time. If you are lucky, you may spot a Tiger! We return to the lodge for breakfast. You can relax in the serene and beautiful surroundings of the camp until it is time for the afternoon game drive. We hope to sight a lot of mammals in the national park like spotted deer, sambhar, gaur, elephant,langur and wild boar. It is very difficult to sight a tiger and we hope we are lucky to catch a glimpse of the majestic beast in these two days. 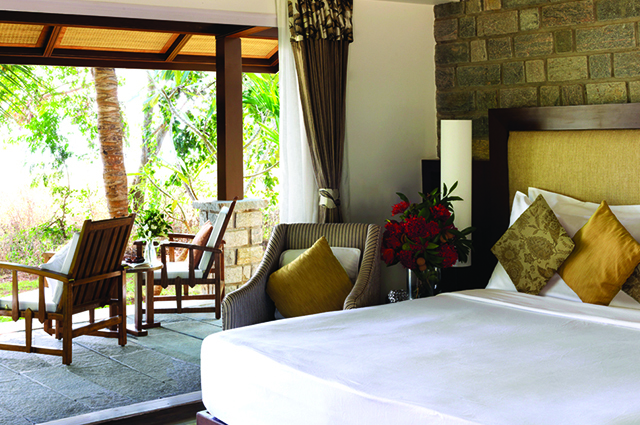 Today, we go on a morning game drive in Bandipur and return to the lodge for breakfast. 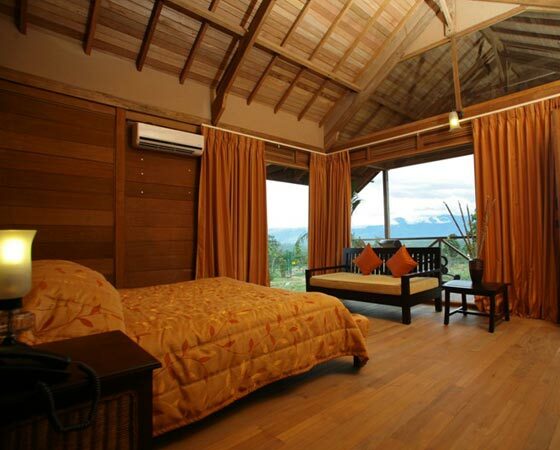 We will then head for Mudumalai National Park, which is about 15 kilometers away. Mudumalai is an important wildlife habitat due to its strategic position between several other protected areas that are a part of the Nilgiri Biosphere Reserve. The animals found here include the Asian Elephant, Tiger, Leopard, Gaur, Hyena, Sloth Bear, Sambar, Chital, Muntjac, Wild Boar, Nilgiri Tahr, Porcupine and Giant Flying Squirrel. Also, 8 percent of the bird species in India are found in Mudumalai Wildlife Sanctuary. On arrival, we will go for a nature walk in Mudumalai National Park. Walking is the best option to explore the jungle and observe the plants, trees, insects and smaller animals of the park. A stop will be made to have our packed lunches, after which we will go on a game drive. We hope to sight Elephants, Spotted Deer and several other animals on the drive. We return to Bandipur for the night. Today we go on the last early morning game safari in Bandipur, after which we head for Nagarahole National Park (approx 3 hours drive). On arrival, we check-in at our lodge and have lunch. After lunch we go on a game drive into Nagarhole National Park and familiarize ourself with the national park’s environment. A part of the Nilgiri Biosphere reserve, Nagarahole is among India’s best national parks. Its rich and varied wildlife includes the Tiger, Leopard, Indian Bison, Sloth Bear, Gaur, Sambar Deer, Chital, Common Muntjac and almost 250 species of birds. The park also has a large population of Elephants. Our exploration of Nagarahole National Park continues over the next two days. We start out early for a morning game drive. During the game drive, you will witness the park’s unspoiled wilderness in the form of serene forests, bubbling streams and a tranquil lake. We may also get to see herds of Elephants on the river bank. We return to the lodge for breakfast. The rest of the morning can be spent on a nature walk, during which you have ample opportunities to take some great photographs. After lunch, we will set out once again to explore Nagarahole’s wilderness. 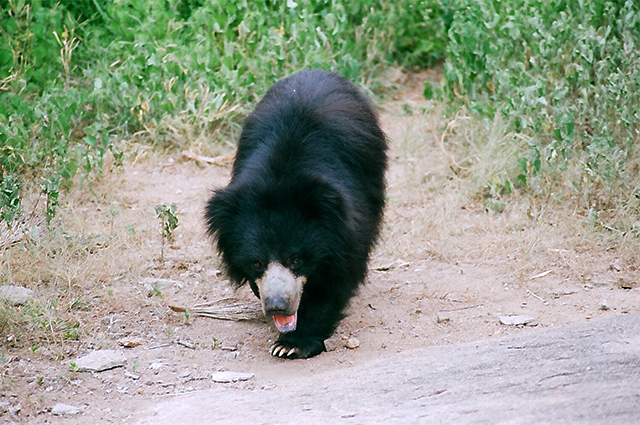 Today we depart from Nagarahole and drive for about 2.5 hours to Mysore, where we will spend the morning sightseeing. Mysore is the second largest city in the Indian state of Karnataka. It was the capital of the erstwhile Kingdom of Mysore. The majestic Mysore Palace, the official residence of the erstwhile royal family, Wodeyars and the city church are worth a visit. You may also want to try a famous regional sweet- the Mysore Pak. After lunch, we set out for Ranganthittu Bird Sanctuary, a birdwatcher's paradise (approx 1 hour drive). Ranganthittu Bird Sanctuary covers an area of 67 square kilometers and consists of six islets on the banks of the river Kaveri. The birds found here include the Painted Stork, Asian Openbill Stork, Common Spoonbill, Woolly necked Stork, Black-headed Ibis, White Ibis, Lesser Whistling Duck, Indian Shag, Stork Billed Kingfisher, Egret, Cormorant, Oriental Darter and Heron. One can also spot numerous small mammals on the islets, including Bonnet Macaques, colonies of Flying Foxes, Common Palms, Indian Gray Mongooses and Monitor Lizards. After about 2 hours of birdwatching, we will drive on towards our last stop- Bangalore (Bengaluru). 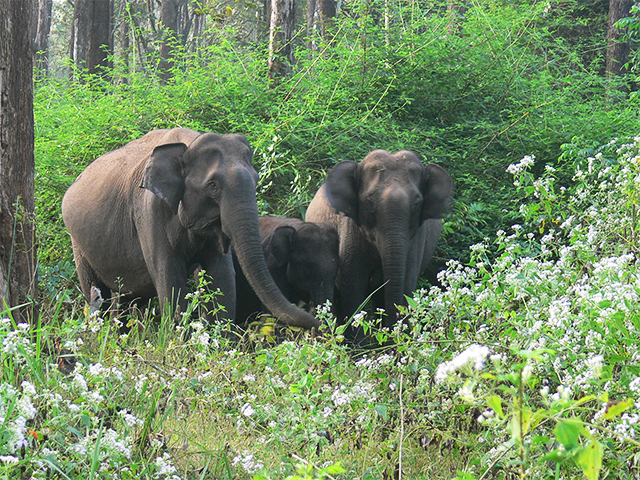 This is the last day of the South India Wildlife Holiday. You can enjoy a leisurely breakfast and relax till it is time to head for Bangalore airport to board your flight back home.